Nothing to Eat or Drink Before Surgery: Why Not? This entire thought process occurs in a millisecond. To a bystander, they would never even know you have just worked through such a detrimental blow. At this point, we often see one of the next steps in the grieving phase; bargaining, depression, or even anger. Those brave enough venture a request "not even a cup of coffee?" … The traditional response of yesteryear would follow, "I'm sorry, not even a cup of coffee." Bummer, they're not going to waiver. Potentially a wave of anger comes over you, "Why not? What on earth does any of this have to do with having surgery on my foot? After all, my foot is so far away from my mouth! If this scenario sounds remotely familiar and you're still wondering "why not," just keep reading! Nothing by mouth is a rule central to the delivery of anesthesia, not necessarily the procedure you are having performed. During anesthesia, normally occurring respiratory reflexes like a gag reflex that normally prevents food or gastric juices from entering the lungs can be suppressed. In other words, the air you breathe and the food you eat normally share a common one-way street in your body to get to their destination. When you receive anesthesia, it relaxes your entire body. So the one-way street can become a two-way street and allow things to get into your lungs that shouldn't be there. When food or gastric juices do roll back into the lungs, it can lead to aspiration pneumonia (infection in the lungs) or pneumonitis (inflammation in the lungs.) Symptoms of aspiration pneumonia are similar to those of pneumonia which include cough, chest pain, fever, fatigue, shortness of breath and wheezing. Symptoms of pneumonitis can involve rapid breathing and pulse, wheezing, cough and fever. Both of these scenarios are serious and can require an extended hospital stay at the least. 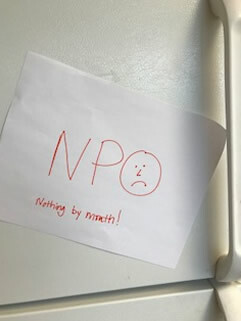 The theory behind NPO is that if nothing is in your stomach, it can't roll back into your lungs. This is a theory that has been proven to be effective over years and years and millions of surgical procedures. For this same reason, we will almost always tell you to take your antacids with a sip of water as prescribed before your surgery, because it reduces acid in your stomach. For many years, the hard fast rule was nothing at all by mouth for 8 hours before surgery. However, like most areas in medicine extensive research is always ongoing to determine the safest guidelines for NPO while considering other factors. NPO for 8 hours is not only a known pain point for patients, but there are also scenarios where the risk to benefit must be studied and considered. The best example would be an infant having surgery. Is it necessary, realistic, or healthy for a baby to be NPO for 8 solid hours? These are the types of questions deliberate and focused research have been working to address for the past several decades. As a result, we have seen modifications to the age old hard fast 8 hour rule in certain situations. The factors we are considering now include the types of liquids or foods you might eat and how quickly they are cleared through the digestive tract, your health history, the planned procedure and the type of anesthesia planned for your procedure. As a result of continued research, you might be surprised to hear something other than a hard fast 8 hour NPO instruction before an upcoming surgery. No matter what NPO instruction you are given before any upcoming surgery, it is vitally important that you follow those instructions and report any morning "oops" moments to your care team for your own safety. 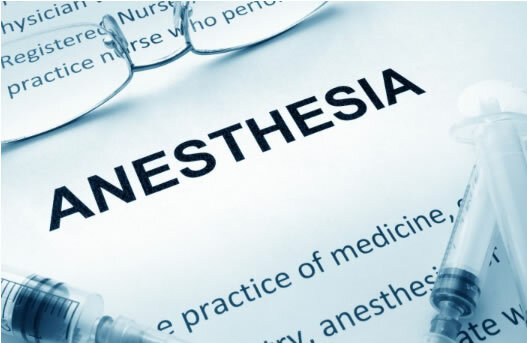 At CSA Surgical Center, our anesthesia team, surgeons and nurses have worked closely and deliberately to establish NPO guidelines in accordance with the latest recommendations from the American Society of Anesthesiologists supported by research that first and foremost ensure your safety while you are in our care. We are proud of our relationship with Mid-America Anesthesia and their exceptional providers, who are continually improving their evidenced based anesthesia practice and have been delivering top notch patient care in this community for many years! We hope the knowledge you now have about why we are so intent on making sure you follow our NPO guidelines coupled with our earnest understanding of how difficult it is to hear those fateful words "nothing to eat or drink after…" , makes this unavoidable surgical pain a little easier to swallow. No pun intended!